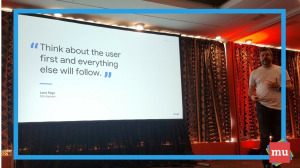 Google’s second Masterclass at the Loeries, ‘Data-Driven Creative’, focussed on the importance of correctly using data – and drawing insights from that data – to offer your clients exactly what they want. media update's Aisling McCarthy attened the seminar on Thursday, 16 August at the Durban ICC as part of the the Loerie Awards Creative Week. Jonathan Andrews, Google’s agency relationship manager, opened the session by explaining the importance of ‘user-first thinking’. He said that by understanding your consumer, you can deliver a better product or service to them. Andrews said that the first step in understanding your consumer is figuring out exactly who they are. While many marketers will use demographic information to get an understanding of who their users are, demographics alone can only offer a very pixelated view of who consumers are. However, the more layers of information you add, the more accurate your view of the consumer becomes. This is because people are increasingly impatient and demand consistency across multiple touchpoints. Kerri Prissman, another agency relationship manager at Google, talked about the difference between data and insights, explaining that data is the raw information and facts, and insights are the conclusions drawn from this data. She quoted Niall Fitzgerald, former chairperson of Unilever, saying “data makes your briefcase heavy, but insights make you rich”. Insights come from the ‘why’ questions. These insights can give marketers ideas of where to look for future ideas; it can spark future questions and help marketers to build hypotheses to test in order to find more answers. 1. Consumer data: What they care about and how they behave. Using this data, brands and marketers can find out more about their consumers and provide them with appropriate, relatable and desirable content. Interested in finding out more about how to use data and insights in your marketing strategy? Read our article, How to get data-driven marketing right.